This is an empowering picture book about what it means to dress ‘like a girl’. Perhaps this phrase has had negative or limiting connotations in the past, but not in this story: it is a cause for celebration. As a group of six diverse little girls get together for a sleepover, their imaginative play leads them to dress up. What should they wear? Who should they be? The illustrations by Lorian Tu-Dean are mixed-media, comprising watercolor, gouache, colored pencil and ink. These images show lively, exuberant, resourceful girls on adventure after adventure, accompanied by their expressive dog. The riot of ideas in the illustrations mirror the text well. 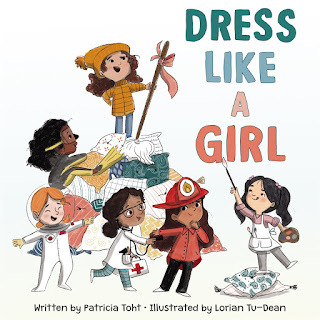 Dress Like a Girl is an engaging story and is also ideal to show girls what they can be in the vein of recent best-selling titles such as Rosie Revere, Engineer! or She Persisted. After all, it is the person underneath that is most important -- the clothes should be tailored to girls’ dreams. "What does it mean to dress like a girl? the secret is heeding them - in your own way."